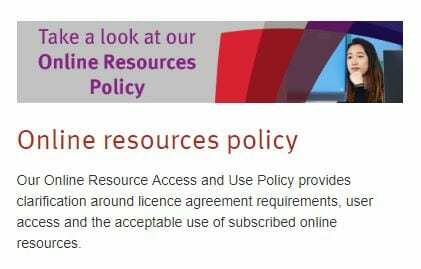 Library Services has developed an Online Resource Access and Use Policy to ensure a clear relationship between the provision of online resources and City’s Education and Student Strategy and Research and Enterprise Strategy. users comply with our licence agreements. You can find out more from the About Library Services section of our website, and if you have any questions or comments about the new policy, please contact us via email, in person or via social media. Next Post Want help with your citing and referencing? Subject Librarian at City, University of London specialising in tea, biscuits and terribly cheesy puns.